​Offshore oil and gas drilling in the US is plagued by “systemic failures” in oversight that are being worsened by Trump administration attempts to expand drilling and roll back safety requirements, a new report has warned. The analysis of public documents by the conservation group Oceana found that while some minor improvements have been made since the BP Deepwater Horizon disaster in 2010, a system of lax oversight, paltry fines and overstretched inspectors risks further major oil spills. This situation is further deteriorating due to the Trump administration opening up almost all US waters to offshore drilling, as well as repealing Obama-era safety rules put in place after the Deepwater Horizon spill, according to the report, released on the eve of the ninth anniversary of the disaster. The report criticizes the Bureau of Safety and Environmental Enforcement (BSEE), the federal agency that oversees offshore drilling, for relying upon industry-written standards and for regularly granting exemptions to safety rules. Penalties for rule-breaking by drilling companies are capped at little more than $44,000 per violation per day, with just 120 BSEE inspectors tasked with conducting 20,000 inspections in US waters each year. Oceana called this oversight regime “alarming” and demanded a much tougher system of inspections and fines. A spokeswoman for BSEE said the agency had doubled its number of inspectors since 2010 “to significantly enhance our inspection program and ensure that we are providing sufficient oversight to drive improved safety performance and environmental stewardship. “BSEE has made significant advances in technology, safety and environmental management systems, inspection strategies and risk management, and the regulatory framework since 2010,” reducing the risk of another accident, the representative said. Conservationists have attacked the Trump administration for its sweeping “energy dominance” agenda that has seen oil and gas businesses invited to explore for resources in waters surrounding the US, including swaths of the Atlantic and Arctic previously put out of bounds due to concerns over environmental impacts and vocal opposition from coastal communities. ​Many leading Republicans in coastal states have also expressed alarm over the huge expansion in drilling, with some warning that the potential auctioning off of Florida’s waters could cost Donald Trump dearly in the state in the 2020 presidential election. In September, BSEE eased key safety rules put in place by the Obama administration in the wake of the Deepwater Horizon calamity, where an explosion killed 11 people and caused millions of barrels of oil to gush into the Gulf of Mexico, fouling the coastline. BSEE said the watered-down rule would save industry around $13m a year. While the BP oil spill is considered the worst environmental disaster in US history, smaller-scale oil spills are commonplace in US waters, with about 6,500 leaks occurring in federal waters between 2007 and 2017. One such oil spill is now in its 15th year, with up to 700 barrels of oil a day flowing into the Gulf of Mexico from a wrecked Taylor Energy oil platform, which was toppled by Hurricane Ivan in 2004. ​Internal government records obtained by the Guardian raise questions about the role of Pennsylvania’s governor, Tom Wolf, role in permitting construction of a controversial fossil fuel pipeline that now faces two criminal investigations stemming from widespread environmental and property damage. The 350-mile, $2.5bn Mariner East 2 natural gas liquids pipeline through southern Pennsylvania has sparked growing outrage. It has caused roughly 140 documented industrial waste spills into wetlands and waterways,destroying numerous residential water wells, and opening large sinkholesjust steps from residents’ homes. Emails, text messages and regulatory records show that the secretary of Pennsylvania’s department of environmental protection, Patrick McDonnell, directed staff to cut short their environmental review even as numerous shortcomings remained in the project’s permit application. The department also appeared to be under pressure from Wolf’s office at the time. A previous report on the text messages involving McDonnell and Banehelped spawn an ongoing Pennsylvania Ethics Commission investigation of Wolf’s office. The other records reviewed by the Guardian have not previously been reported. ​Wolf, who is a Democrat, has received substantial donations from companies with a financial stake in Mariner East 2, including $20,000 toward his 2018 re-election campaign from the gas producer EQT Corporation, which has a shipping contract with the pipeline. During his 2014 campaign, he received$1.5m in campaign contributions from organizations, individuals and Pacs tied to the oil and gas industry. A bipartisan group of 14 state legislators have also signed a letter to Wolfrequesting he issue a moratorium on both of the existing Mariner East pipelines until ETP provides an emergency response plan to first responders in Chester county in case of a pipeline rupture or other emergency. In late 2017, ETP failed to report a leak of drilling fluid during pipeline construction in in West Whiteland Township which caused sinkholes to open in a residential subdivision. One 20ft-deep chasm, which exposed the Mariner East 1 pipeline, came within 10 feet of a house. Even though the company claimed it had remediated the problem, roughly a year later, the pipeline caused sinkholes again in virtually the exact same location, raising fears of a pipeline explosion. An ETP spokeswoman, Lisa Dellinger, said in a statement to the Guardian that “there is no legitimate basis for conducting a criminal investigation into our company and the Mariner East pipelines,” and also said the company had worked closely with local officials to respond to citizens’ concerns. ​It would be more expensive to keep the majority of U.S. coal plants open than to replace them with new wind and solar power alternatives, according to new findings published Monday. President Donald Trump has worked hard to save U.S. coal, going so far as to advocate for a financial bailout to rescue the dying industry. But data largely suggests that coal’s economic value will continue to plummet, a downturn that comes as wind and solar power are becoming increasingly cheaper and more viable options. “America has officially entered the ‘coal cost crossover’ – where existing coal is increasingly more expensive than cleaner alternatives,” the report argues. Using a data set of coal, wind, and solar costs, the report contrasts the cost of generating energy at coal plants against costs associated with potential wind or solar hubs in the nearby area. The report only examines the “local” area — defined as 35 miles from a given coal plant — to determine whether the plant has the potential to be replaced by cheaper renewables within that zone. Restricting the distance to the local area, however, leads the analysis to be more conservative. “That local analysis is quite constraining,” O’Boyle said, noting that wind and solar grow in number when considering areas farther away from coal plants. The authors indicated that they opted for the local comparison because it offers a greater incentive to communities looking to transition from coal to renewables. Nonetheless, the findings are stark even on a local level: 211 gigawatts (GW) of existing U.S. coal capacity as of the end of 2017 is at risk from renewable energy alternatives capable of providing the same amount of energy at a cheaper price. Within six years, that number increases to 246 GW, or nearly the entire U.S. fleet. Some 93 GW of existing U.S. coal capacity, meanwhile, is substantially at risk from new renewable energy sources in 2018, with wind and solar poised to undercut costs by 25 percent. Even as federal renewable energy tax credits phase out, the amount of coal at risk of being replaced by renewables is projected to increase to 140 GW by 2025. The firms behind the study both support renewable energy and argue in favor of a transition away from fossil fuels. But their analysis builds on existing research showing that the U.S. coal industry is rapidly on the decline. In fact, more coal plants shut down during Trump’s first two years in office than during former President Barack Obama’s entire first term. U.S. coal consumption also dropped to its lowest rate in nearly 40 years in 2018. That swift decline has come hand in hand with the rise of wind and solar energy, both of which are widely considered far more economically appealing than coal. “Coal is a dirty and expensive way to generate electricity,” the report observes, going on to note that it is becoming “increasingly uneconomic” when contrasted with new wind and solar opportunities. Regional opportunities also abound. While the Midwest is likely to be disproportionately impacted by the closure of coal plants within the next five years, the region has ample potential for wind energy, according to the report. There are also abundant solar opportunities in a number of areas, including the sunny Southeast, where almost all coal plants are already substantially at risk. The report, however, doesn’t analyze the role of natural gas in dethroning coal power plants. Natural gas is widely seen as a cheap alternative to coal, along with renewables. But natural gas is a fossil fuel with severe implications for human health and the environment, a reality that played a role in its exemption from the report, the authors told ThinkProgress. The analysis also offers mixed findings for those championing efforts like the Green New Deal resolution introduced by Rep. Alexandria Ocasio-Cortez (D-NY) and Sen. Ed Markey (D-MA). The resolution pushes for moving away from fossil fuels while creating jobs and protecting the livelihood of communities impacted by the shift. Monday’s study acknowledges that if regulators, customers, and utilities looked beyond the local 35-mile limit examined in the report, the potential for costs to drop increases — but this could mean fewer jobs in the immediate area as renewables replace coal farther outside the local community. “Building local renewables in the immediate vicinity of coal plants implies wind and solar could replace local jobs, expand the tax base, reuse existing transmission, and locate in the same utility service territory. But these constraints are quite restrictive,” the analysis acknowledges. That doesn’t mean that starting with a local framework isn’t a good approach. O’Boyle noted that the findings could prompt “policymakers and other stakeholders” to assess the benefits to their communities that a shift to renewables might entail. ​These two sets of chemicals are not currently on the EPA’s priority list. There are hundreds of different variations of PAH chemicals and levels of toxicity (alkylated-PAHs, for instance, are a derivative of the main “parent” PAH compounds). Burning coal and oil is the main source for these chemicals. ​Scientists are still studying how the various chemicals impact humans; a range of PAH chemicals are classified as suspected or possibly carcinogenic to humans. What is known though, is that alkylated-PAHs are likely more toxic than other types of PAHs. They also take a longer time to biodegrade in the environment. ​Of course, some degree of collaboration is needed in order for the EPA to properly conduct its study and gather the necessary data. However, the internal emails provide insight into the scale of influence the fossil fuel lobby is trying to exert at the very early stages of decision making. 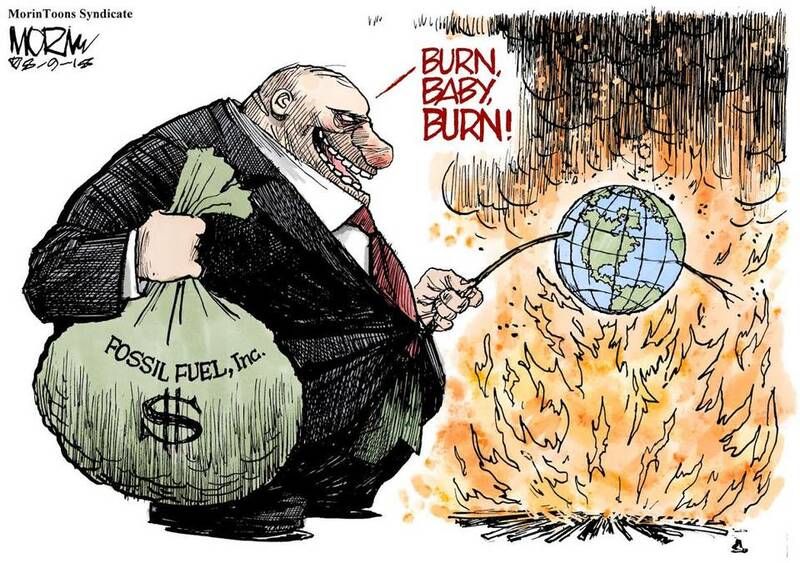 destroying the world for oil!!! ​The United States and Saudi Arabia have hamstrung global efforts to scrutinise climate geoengineering in order to benefit their fossil fuel industries, according to multiple sources at the United Nations environment assembly, taking place this week in Nairobi. ​The petrochemical industry sees it as a way to justify further expansion of fossil fuel industries. Chevron, BHP and other high-emitting companies have invested in companies that are pushing ahead with experiments to pull CO2out of the air. ​Opponents counter that earlier, more thorough studies show serious impacts on Asian monsoon cycles, African droughts, tropical cyclones and extreme temperatures. They want the UN to impose a moratorium on outdoor experiments using this form of technology. The American Petroleum Institute has led the charge on weakening methane emission regulations. Several of the world’s biggest oil companies are voicing their support for federal regulations on methane emissions, even as the trade association lobbying on their behalf continues to back the Trump administration’s efforts to weaken those rules. Oil giants, including Shell and ExxonMobil, said this week that they oppose the Environmental Protection Agency’s (EPA) efforts to weaken regulations on methane, a major byproduct of fracking for oil and gas. But the American Petroleum Institute (API), a trade association representing the oil and gas industry, has consistently resisted stricter methane rules, leaving environmental advocates skeptical about the new push from oil companies. “There’s a real disconnect here… these companies are members of API,” Kelly Martin, director of the Sierra Club’s Beyond Dirty Fuels campaign, told ThinkProgress. She noted that API has been at the forefront of the push for less stringent methane regulations. While carbon dioxide is typically singled out as a leading greenhouse gas, methane is 30 times more potent when it comes to trapping heat, making it an undeniable contributor to global warming. ​The sudden outpouring of support for federal methane regulations from several major oil companies came during CERAWeek, a major global energy event in Houston, Texas. On Tuesday, Gretchen Watkins, the U.S. president of Shell, announced that the company was breaking its policy of not “trying to tell governments how to do their jobs” to call for the EPA to continue “direct regulation” of methane emissions. “The U.S. should not strip methane regulations out of the Clean Air Act. We need to do more,” said Watkins. The Houston-based EOG Resources Inc. — formerly Enron Oil & Gas — similarly announced on its website that the company supports regulating methane, following shareholder pressure to reduce emissions. And through its subsidiary XTO Energy Inc., Exxon expressed related sentiments in an interview with the Environmental Defense Fund (EDF), advocating for the EPA to continue regulating methane. Also on Tuesday, BP CEO Bob Dudley acknowledged the influence of changing public perception on climate change. “There’s a rising tide of concern on many fronts about the lack of progress on climate issues, and I would say not just concern, but anger,” Dudley said at CERAWeek, noting that young people in particular are increasingly more concerned about climate change and want action. Oil companies’ public recognition of that trend, and stated support for stricter methane regulations, has earned some praise from lawmakers. Rep. Diana DeGette (D-CO) tweeted that the support for regulations from such companies prove “just how dangerous it [methane] really is,” while Sen. Martin Heinrich (D-NM) underscored the message being conveyed to the EPA. “When even the oil and gas industry agrees we need stronger methane standards to combat climate change, maybe it’s time to strengthen methane emissions rules,” wrote Heinrich on Twitter. But environmental advocates remain largely unimpressed, not least of all because of the looming shadow of API. “Many of these same companies that are coming out with these strong statements are still members of API,” said Lila Holzman, the energy program manager for the nonprofit shareholder advocacy group As You Sow. Holzman told ThinkProgress that the shift in rhetoric from oil and gas companies reflects years of pressure from shareholders, along with the threat leaking methane poses to companies themselves. “I think it shows that they recognize the risks we’ve all been talking about,” she said. But their ongoing relationship with API represents a hurdle for Holzman. “They’re [the oil companies] allowing groups to speak for them that say the opposite” when it comes to this regulation, she said. Martin, of the Sierra Club, similarly expressed skepticism. That cynicism is seemingly merited. In his comments Tuesday, BP CEO Dudley spoke about the support for proposals like the Green New Deal resolution introduced in February by Rep. Alexandria Ocasio-Cortez (D-NY) and Sen. Ed Markey (D-MA). But BP itself is under fire for undermining that messaging. While the oil company is notably collaborating with EDF in an effort to reduce methane emissions, a report on Wednesday found that the company has lobbied the Trump administration to weaken regulation of the greenhouse gas. According to documents collected by Unearthed, an investigative news site house at Greenpeace UK, BP both opposed and then successfully helped reverse methane regulations in the United States. The company worked closely with API on the association’s efforts to undermine the emissions rules. “In yet another example of corporate doublespeak, BP claims to support limiting wasteful methane leakage and flaring, yet lobbied against a common sense rule to do just that. I wish I could say I was surprised, but I’m not,” said Sen. Sheldon Whitehouse (D-RI) in a statement. The lawmaker sits on the Senate environment committee. Despite that clear conflict, oil and gas companies do appear to be acknowledging public sentiment. Polling indicates that the majority of Americans care about climate change and are growing concerned about inaction. But advocates worry that companies like Shell and BP are changing their tone without changing their actual practices. “We need to keep pressing so it’s not the sort of thing that a company thinks they have a box checked and they’re set,” said Holzman, noting that real climate action will take far more than pushing for basic regulations. Martin, meanwhile, emphasized that no amount of lip service will shift how many climate advocates view the oil and gas industry. U. S. environmental regulators quietly changed the way they assess applications from refineries for waivers from the nation’s biofuels law, making it possible for highly profitable plants to secure lucrative exemptions, according to court documents filed by a biofuels trade group on Thursday. The new documents, part of a lawsuit that began last year, could provide the most complete explanation to date of how the Environmental Protection Agency vastly expanded the number of small refinery hardship biofuel waivers under former Administrator Scott Pruitt, including by granting exemptions to oil majors Exxon Mobil and Chevron. The expansion of the waiver program saved the oil industry hundreds of millions of dollars but angered farmers in the nation’s heartland, who said it crushed the credit prices that are an integral part of the ethanol industry. According to the documents, filed by the Advanced Biofuels Association (ABFA), the EPA in 2017 stopped considering whether compliance with the Renewable Fuel Standard (RFS) would prevent a refinery from making money and being competitive. Instead, the agency considered primarily whether compliance would cause a “disproportionate” impact on the facility, an easier hurdle to clear. Under the RFS, refiners must mix biofuels like ethanol with their gasoline and diesel, but smaller refineries can be exempted if they can prove that complying would cause them measurable financial harm. ABFA, which represents 35 companies responsible for 4.4 billion gallons of renewable fuel production around the globe, is asking a federal judge to rule whether the EPA’s expansion of the waiver program was legal, which they argue depresses demand for their biofuel. The Department of Energy traditionally scored the hardship applications on a two-prong matrix that considered whether the RFS posed a disproportionate hardship, and whether the plant could remain viable if required to comply. Prior to May 2017, a refinery would have to pass both tests to get an exemption, ABFA alleged, citing EPA correspondence with a refiner it said it had obtained. “In prior decisions, EPA considered that a small refinery could not show disproportionate economic hardship without showing an effect on ‘viability,’ but we are changing our approach,” the EPA wrote in 2017 to an unnamed refiner, according to an excerpt included in the court filing. The EPA turned over documents related to 48 applications for waivers to the ABFA as part of the legal discovery process. In 24 cases, the Energy Department gave the applicant a viability score of zero, meaning the RFS would have no impact on the refinery’s ability to stay competitive and profitable, but the EPA still granted the waiver, ABFA alleged in the court documents. ​The EPA also routinely ignored the department’s recommendations to grant partial exemptions and instead granted full exemptions, ABFA alleged in court documents. An EPA official said the agency had no comment. The trade group has asked a federal court in Washington to rule on the legality of the expansion of the hardship waivers under Pruitt. The scoring system has faced judicial scrutiny in the past, with judges in different circuits siding with and against the agency. In an often cited case, the 10th U.S. Circuit Court of Appeals in Denver ruled in 2017 that the EPA had in the past used too strict a definition of viability that required the applicant to prove complying with the RFS would cause the plant to shut or the company to file for bankruptcy. While the EPA did not announce the changes publicly, the agency clearly sent the message to refiners, ABFA said. Oil majors such as Chevron and Exxon Mobil, who did not apply for waivers in the past, were granted exemptions at their smaller refineries, Reuters previously reported. Billionaire Carl Icahn, a one-time Trump adviser who helped Pruitt land the job at the EPA, was also granted exemptions at his smaller refineries owned by CVR Energy after previously been denied them by the Obama administration. In all, the number of exemptions granted went from 7 in 2015 to at least 29 in 2017, EPA data shows. The EPA is set to decide on 37 additional pending applications for 2018 by the end of the month, a move that will be closely watched by the corn and oil industries. Residents Say Natural Gas Production Is Marring West Virginia. And the Legislature Isn’t Doing Anything About It. Though studies recommended additional protections years ago, lawmakers have not taken action to put them in place. But when residents sued, a Supreme Court justice said it was the Legislature’s job. ​West Virginia Delegate Terri Sypolt says she understands how natural gas drilling has changed the look and feel of communities in the state, bringing an influx of noisy truck traffic and construction. “I’m thinking about a neighbor’s dog howling for two years right at your doorstep,” said Sypolt, a Republican from Preston County, in the northern region of the state. So when she returned to Charleston for this year’s legislative session, she introduced a bill for the third consecutive year to monitor the air and noise around drilling operations, hoping her colleagues would take action to help residents. The bill didn’t make it onto a committee agenda, let alone to the floor of the House of Delegates. As natural gas booms around the Marcellus Shale, nearby residents continue to bear the burden of the industry’s growth. Many live with constant light, truck traffic, dust and noise from gas production fueled by horizontal drilling and hydraulic fracturing, or fracking, as the Gazette-Mail and ProPublica chronicled last year. Business groups and the state coal association have argued in court filings that the inconveniences are unavoidable. ​With days left in the legislative session, proponents of reform have essentially given up. The deadline has passed for bills to initially clear the House, and lawmakers and groups that have pushed for protection for residents have moved on to other issues. “You’re the first person to ask me about it,” she told a reporter in January. Delegate Mike Pushkin, a Democrat from Kanawha County, sponsored legislation to protect surface owners from 2015 to 2017, but he didn’t bother this year. The inaction isn’t what was promised in 2011, when then-Gov. Earl Ray Tomblin signed into law the Natural Gas Horizontal Well Control Act. The law included a variety of new environmental protection standards, but it delayed some key protections for residents until mandated studies of those issues were completed by the state Department of Environmental Protection and West Virginia University. ​Those studies were completed in May 2013 and recommended heightened safeguards, including a more stringent setback, or a buffer zone, measured from the edge of drilling operations to homes, and building a fence or planting trees to curb “problematic” noise levels. Lawmakers never acted on those recommendations under either Democratic or Republican leadership. Under the current governor, Jim Justice, the state Department of Environmental Protection revoked a rule that would have protected residents from some noise and light. Downstream Strategies, a Morgantown-based environmental consulting firm, conducted its own study about the effects of natural gas drilling and extraction in 2017. According to the report, well pads, which are clearings where horizontal natural gas wells are drilled into the earth, grew from 1.6 acres, on average, to 2.4 acres between 2007 and 2014. In that time, the land area covered by well pads and wastewater impoundments grew from 12 acres to 1,286 acres. The solution, the group argued, was to require buffer zones between drilling and sensitive areas, like schools and public land. Evan Hansen, a Democrat from Monongalia County, co-authored the study and was elected last year to a seat in the House of Delegates. This session, he co-sponsored Sypolt’s bill to implement the DEP and WVU study recommendations, saying he is interested in applying the best science. But Delegate Bill Anderson, who chairs the House Energy Committee and sets the agenda, said there’s no “appetite” for the bills. “Well, they’re not as high on my priority list as some other bills,” said Anderson, a Republican from Wood County. Anderson said he remembers visiting communities affected by Marcellus Shale drilling in 2011. He wanted a 1,000-foot distance between wells and homes, he said, but lawmakers ultimately decided on a 625-foot distance between the center of the pad and a house, which remains the law. The state’s oil and natural gas industry employed about 12,000 people in drilling and extraction jobs in 2017, according to WorkForce West Virginia, which is a division of the state Department of Commerce. The West Virginia Oil and Natural Gas Association, the Independent Oil and Gas Association and the DEP did not respond to requests for comment for this story. ​This legislative session, Anderson’s committee moved along bills he co-sponsored that are favored by oil and gas organizations because they would make it easier and cheaper to drill. One would allow companies to drill horizontal deep wells close together. Another would remove the severance tax on low-producing oil and gas wells. The bills passed out of Anderson’s committee and are pending in other committees now. In November, House Speaker Roger Hanshaw said he thought the DEP might be best equipped to handle the 2013 studies’ recommendations in its rulemaking process. “Protection of surface-owner rights is important and, from time to time, we do need to review those rules to make sure they still comport with both current industry practices and current surface-owner and homeowner needs,” said Hanshaw, a gas industry lawyer and Republican from Clay County whose conflicts of interest were detailed last fall by the Gazette-Mail and ProPublica. Those decisions, he said, could be made by the DEP. But the DEP hasn’t acted, and recommended in 2013 that the Legislature take action. Even as the Legislature declines to act, there are signs that the courts don’t want to get involved either — saying it’s the Legislature’s responsibility. In January, the West Virginia Supreme Court heard arguments from a lawyer representing four families who live in Harrison County and say they face constant light, noise and traffic issues from Antero Resources’ Marcellus Shale drilling. The lawyer argued that a jury should determine whether these kinds of disturbances count as a nuisance, although lower courts had dismissed the case. In response, Justice Evan Jenkins asked why the matter belonged in the courts and not before lawmakers. “Why should this really not be an issue for the Legislature to address, rather than a jury issue on any given nuisance claim to decide what is reasonable or not?” he said. The court hasn’t ruled yet, and oral arguments in a related case are scheduled for March 12. Citizen groups said they now have different priorities, too. The Surface Owners’ Rights Organization, which has strongly pushed for the implementation of the studies, has shifted focus to getting the DEP to clean up abandoned wells, said Dave McMahon, co-founder of the group. A lobbyist for the West Virginia Farm Bureau said it would support the legislation, but it has other priorities, as well. “If you have a well pad right next to your house going 24/7 and you can’t sleep in your own home, that’s ridiculous, that should not happen,” said Tom Huber, president of the West Virginia Royalty Owners Association. Still, he said, the bill wasn’t as high a priority as a bill to reform the way property is divided among heirs. The failure to act on recommendations isn’t new, said Angie Rosser, executive director of the West Virginia Rivers Coalition. The Legislature routinely stalls its decision-making, saying it needs more information, she said. And then, when lawmakers receive that information, they often refuse to act, putting citizens at risk. That’s not just frustrating, she said, it’s dangerous. The Trump administration is working to "advance drilling no matter the cost," say public lands advocates. ​New data analysis shows that the government accepted 260 oil and gas drilling permit applications during the partial government shutdown last month, even as federal agencies suffered severe staffing shortages at all levels. Those findings shed more light on the extent to which the Interior Department (DOI) favored the oil and gas industry over public lands protection during the longest government shutdown in history — a decision House Democrats now plan to probe. The research published by the Colorado-based nonpartisan nonprofit Center for Western Priorities (CWP) was based on data published on government databases. The analysis found that of the 260 applications for drilling permits accepted during the shutdown across the country, 40 permits were approved by the shutdown’s end, along with 15 oil and gas leases. An additional 162 nominations of public lands parcels were accepted with the intent of leasing for oil and gas development. These findings come at the same time as reporting by local New Mexico news outlet, Carlsbad Current Argus, which found the Bureau of Land Management (BLM)’s Carlsbad Field Office processed around 80 applications to drill on public lands between Dec. 22, 2018 and Jan. 25, 2019, when the shutdown ended. In fact, drilling applications never ceased during the more than four weeks when the government remained partially closed according to the oil and gas shutdown trackermaintained by CWP. Meanwhile around 800,000 federal employees were furloughed or working without pay during the shutdown across agencies. In a comment to ThinkProgress on Tuesday, CWP’s Jesse Prentice-Dunn emphasized that the findings reflect the priorities of Acting Interior Secretary David Bernhardt, who has spent his career working closely with the oil industry. “The shutdown was a clear statement of… Bernhardt’s priorities—advance drilling no matter the cost,” said Prentice-Dunn. Applications were consistently accepted by BLM throughout the shutdown, albeit at a slower pace, per CWP’s tracker. Beginning Jan. 7, drilling permits were approved as well, while oil and gas leases spiked on Jan. 12. ​BLM shutdown contingency plans deemed many employees essential who work “on selected energy, minerals and other associated permit activities for which the bureau charges a processing fee.” This mostly impacted workers in New Mexico, a major drilling hub. The prioritization of oil and gas during the shutdown came as public lands more broadly suffered. In a highly controversial move, DOI opted to leave many national parks and monuments open, something that has been avoided in previous extended shutdowns. Despite being open, public services and staff were largely non-existent, allowing park visitors to roam freely in delicate and carefully-maintained parts of the country. Reports of vandalism, deaths, and damage mounted as the shutdown dragged on, impacting parks like Joshua Tree in California and the Great Smoky Mountains which straddle Tennessee and North Carolina. “It is both telling and concerning that under Bernhardt the Interior Department cut legal corners to keep the lights on for oil and gas while leaving our parks open to looting and vandalism,” said Prentice-Dunn. And while drilling on public lands endured throughout the shutdown, drilling offshore proved more controversial. Initial contingency plans for the Bureau of Ocean Energy Management (BOEM) largely halted work on opening up virtually all U.S. waters to oil and gas drilling. But three weeks into the shutdown, BOEM recalled 40 employees to assist with the five-year Outer Continental Shelf (OCS) leasing program and with seismic permitting efforts, a move that came as offshore wind projects stalled. That decision sparked backlash, as it coincided with South Carolina’s efforts to join a lawsuit opposing seismic drilling in the waters off its coast. The government argued it could not respond to the state’s request due to the shutdown, but a federal judge ruled on Jan. 18 that simultaneously moving forward on a controversial project while avoiding legal challenges created an unfair situation. From that point through the end of the shutdown, the government was barred from seismic permitting work. House Democrats have moved to probe such decisions, looking into the Trump administration’s decisions not only to prioritize oil and gas drilling but also to keep the parks open. In an email to ThinkProgress, Interior-Environment Appropriations Subcommittee Chair Betty McCollum (DFL-MN) said that she would “certainly be looking into” not only the BOEM worker recall but also broader oil and gas efforts during the shutdown. House Natural Resources Committee Chair Raúl Grijalva (D-AZ) has similarly looked to scrutinize the Trump administration’s shutdown actions. Both Grijalva and McCollum have overseen hearings aimed at addressing DOI’s decisions during that time and have requested that the Government Accountability Office conduct a review of the department’s shutdown conduct. natural gas royalty checks. The company says it wants to “turn over a new leaf” in its relationship with the state’s residents. ​The second-largest natural gas producer in West Virginia will pay $53.5 million to settle a lawsuit that alleged the company was cheating thousands of state residents and businesses by shorting them on gas royalty payments, according to terms of the deal unsealed in court this week. ​A trial was scheduled to begin in November but was canceled after the parties reached the tentative settlement. Details of the settlement were unsealed Wednesday. ​Settlement payments will be calculated based on such factors as the amount of gas produced and sold from each well, as well as how much was deducted from royalty payments. The number of people who submit claims could also affect settlement payments. Each member of the class that submits a claim will receive a minimum payment of at least $200. The settlement allows lawyers to collect up to one-third of the settlement, or roughly $18 million, subject to approval from the court. ​THE OBJECTION RAISED most frequently when it comes to a Green New Deal is its cost. It’s preposterous; it’s too expensive; we just can’t afford it. But before scoffing at the prospect of the wealthiest nation in the history of the world funding such a project, it’s worth taking a look at what one of the country’s poorest states was recently able to spend. South Carolina, in a bid to expand its generation of nuclear power in recent years, dropped $9 billion on a single project — and has nothing to show for it. There are no firm figures tied to a Green New Deal, but former Green Party presidential candidate Jill Stein’s proposed version of the project would have cost between $700 billion and $1 trillion. The new plan, being crafted with the help of progressive groups like the Sunrise Movement and pushed to the top of the House legislative agenda by Alexandria Ocasio-Cortez and other progressives, promises more substantial change on a much shorter schedule. In addition to moving the U.S. to 100 percent renewable energy in 10 years, upgrading all residential and industrial buildings for energy efficiency, and eliminating greenhouse gases from manufacturing and agriculture, it includes a jobs guarantee and a recognition of the rights of tribal nations. Ocasio-Cortez and Massachusetts Sen. Ed Markey are planning to introduce legislation for the plan this week, Axios reported. It started in 2008. SCE&G and Santee Cooper announced plans to add two nuclear reactors to the V.C. Summer Nuclear Station in Jenkinsville, South Carolina, and contracted Westinghouse Electric Company, owned by Toshiba, to handle construction. The state’s Public Service Commission (PSC) approved the plan in early 2009, with construction slated to begin in 2012, and the first reactor set to begin operating in 2016. In late 2011, SCE&G announced the project’s first delay in a quarterly report to the Office of Regulatory Staff, which represents utilities in front of the PSC, citing “module redesign, production issues, manpower issues and Quality Assurance and Quality Control (QA/QC) issues.” The company estimated an 11-month setback and said its contractor, the Shaw Group, operating out of a facility in Louisiana, reported that the issues had been resolved. But SCE&G said they were still monitoring the situation “carefully” and considered “it to be a focus area for the project.” The Shaw facility would later face a federal probe over unrelated allegations that workers broke protocol and falsified records, which employees admitted to. The company alerted more delays in mid-2013, citing manufacturing issues. Soon, Santee Cooper asked SCE&G to bring in another company to manage the project. Not long after that, both companies announced the project would cost $1.2 billion more than they’d expected. Again, they pushed back the project’s completion date. Documents released as the project unraveled show that both SCE&G and Santee Cooper were well aware of shortcomings, mismanagement, and lack of oversight that eventually made the reactors impossible to complete, years before Westinghouse declared bankruptcy and both companies pulled out. Only 48 percent of South Carolinians know about the failed program, according to an October statewide poll surveying electric ratepayers. “The utilities are incredibly powerful political lobbies in the state,” Jaczko said. “It’s now $2.3 billion that they’re gonna be able to get,” he said, and that doesn’t include the rate of return Dominion says it’s entitled to. Thanks to a state law passed in 2007, residents in South Carolina are footing the bill for a massive failed nuclear reactor program that cost a total of $9 billion. Analysts say that corporate mismanagement and poor oversight means residents and their families will be paying for that failed energy program — which never produced a watt of energy — for the next 20 years or more. South Carolina Attorney General Alan Wilson has since called parts of the law, the Base Load Review Act, “constitutionally suspect,” and state senators have voted to overturn it — but that wouldn’t necessarily get ratepayers off the hook for paying for the failed project. Both the Justice Department and the Securities and Exchange Commissionopened separate investigations into the failed project, and at least 19 lawsuits have been filed against one company involved. The two South Carolina companies, South Carolina Electric & Gas and Santee Cooper, a state-owned utility, spent $9 billion on a plan to build two nuclear reactors and eventually canceled it due to a series of cost miscalculations and corporate buyouts that left one construction company bankrupt and sent shockwaves all the way to Japanese tech giant Toshiba. Dominion Energy, an energy giant in the region, has since bought out SCE&G’s parent company, SCANA Corp., for $7.9 billion — almost the entire cost of the failed project — pledged to partially refund ratepayers and cut electricity rates, which SCE&G hiked at least nine timesthroughout the project’s first eight years in order to pay for it. “It is a major issue that the legislature’s dealing with,” Timmons said. The congressman didn’t have any updates on how or when the remainder of the bill would resolved. After Dominion bought out SCANA and settled their portion of the bill, ratepayers are still responsible for about $2.3 billion. “For nothing, they get nothing,” Jaczko told The Intercept. “They basically pay money up front for a project that never materialized, and now are still gonna be asked to pay for it. And that is a significant break from the way that traditional rate recovery used to work,” he said. But because nuclear power involves heavier upfront capital costs and financing charges, Jaczko explained, states looking to revive nuclear power tried to bypass those extra costs by passing laws allowing companies to save money by recovering the cost of financing the projects during the period of construction. “Even the law that was written in South Carolina envisioned the fact that the project could get canceled. But of course everybody promised that that wouldn’t happen,” Jaczko said. Sen. Tim Scott told The Intercept that it was hard to pin the blame for the disastrous project on any one entity. “But certainly the Westinghouse bid coming back three times higher than their original estimation made the likelihood of success challenging. And then all the decisions that were made pending that being an accurate price all fell apart,” he said. He did not answer a question of whether ratepayers would have to pay $2.3 billion for nothing. For scale, the national deficit for fiscal year 2019 is just shy of $1 trillion. Of the $4.4 trillion federal budget, military spending across agencies makes up close to $800 billion. The federal government spent about $1.1 trillion on health care in 2018. The latest government shutdown cost the U.S. an estimated $11 billion, the Congressional Budget Office reported. Trump requested $5.7 billion for a border wall, and Republicans in the House found it. But $9 billion and zero nuclear reactors later, ratepayers in South Carolina have no say after their legislators played with the state’s resources and lost. If one state can throw away $9 billion on a project that never happened, legislators in Washington will have a difficult time claiming that they can’t find federal dollars to finance a plan that 81 percent of registered voters support. “We can pay for a Green New Deal in the same way we pay for — whether it’s wars, or tax cuts, or any of the other great social programs that we have,” Greg Carlock told The Intercept. He’s a senior adviser at Data for Progress, where he authored a report outlining policy proposals for the Green New Deal. Unlike Ocasio-Cortez, Carlock says he disagrees with the argument that you have to tax the wealthy, or the middle class, to pay for a Green New Deal. Instead, he argues, Congress should just authorize new spending, like it does for everything else. “There has been a really well-crafted narrative to bring up fears about deficit spending and the debt,” Carlock said. “I think that we, one, have to just break out of this fear that somehow this number that we call debt is a bad thing. Because it’s not the same kind of debt that a household has, or that a business has,” he said. Investing in clean energy, sustainable jobs, and a basic standard of health care would actually save money in the long run — tens to hundreds of billions of dollars per year, according to a climate assessment released under the Trump administration this year. The argument that the money isn’t there just doesn’t hold up. “Any politician whose first question about the Green New Deal is how to pay for it isn’t taking seriously the millions who will die if we fail to take action on the scale scientists say we need,” Stephen Hanlon, communications director for the Sunrise Movement, said in a statement to The Intercept. “What we are talking about is a putting millions of people to work so they can buy food for their families, etc. This is the greatest investment in the American economy in generations, and that kind of investment pays substantial dividends,” Hanlon said. Meanwhile, a $28 billion nuclear project in Georgia is headed for a similar fate. The last time U.S. drillers pumped 10 million barrels of crude a day, Richard Nixon was in the White House. The first oil crisis hadn’t yet scared Americans into buying Toyotas, and fracking was an experimental technique a handful of engineers were trying, with meager success, to popularize. It was 1970, and oil sold for $1.80 a barrel. Almost five decades later, with oil hovering near $65 a barrel, daily U.S. crude output is about to hit the eight-digit mark again. It’s a significant milestone on the way to fulfilling a dream that a generation ago seemed far-fetched: By the end of the year, the U.S. may well be the world’s biggest oil producer. With that, America takes a big step toward energy independence. The U.S. crowing from the top of a hill long occupied by Saudi Arabia or Russia would scramble geopolitics. A new world energy order could emerge. That shuffling will be good for America but not so much for the planet. ​For one, the influence of one of the most powerful forces of the past half-century, the modern petrostate, would be diminished. No longer would “America First” diplomats need to tiptoe around oil-supplying nations such as Saudi Arabia. The Organization of Petroleum Exporting Countries would find it tougher to agree on production guidelines, and lower prices could result, reopening old wounds in the cartel. That would take some muscle out of Vladimir Putin’s foreign policy, while Russia’s oligarchs would find it more difficult to maintain the lifestyles to which they’ve become accustomed. President Donald Trump, sensing an opportunity, is looking past independence to what he calls energy dominance. His administration plans to open vast ocean acreage to offshore exploration and for the first time in 40 years allow drilling in the Arctic National Wildlife Refuge. It may take years to tap, but the Alaska payoff alone is eye-popping—an estimated 11.8 billion barrels of technically recoverable crude. It sounds good, but be careful what you wish for. The last three years have been the hottest since recordkeeping began in the 19th century, and there’s little room in Trump’s plan for energy sources that treat the planet kindly. Governors of coastal states have already pointed out that an offshore spill could devastate tourism—another trillion-dollar industry—not to mention wreck fragile littoral environments. Florida has already applied for a waiver from such drilling. More supply could lower prices, in turn discouraging investments in renewables such as solar and wind. Those tend to spike when oil prices rise, so enthusiasm for nonpolluting, nonwarming energies of the future could wane. For now, though, the petroleum train is chugging. And you can thank the resilience of the U.S. shale industry for it. Shale’s triumph seemed impossible a few years ago. In late 2014, Saudi Arabia targeted rivals, including American drillers. Rather than cutting production to keep prices high, Saudi Arabia persuaded OPEC to open the taps, sending prices lower than $40 a barrel in December, down from more than $100 a barrel just four months previous. The Saudis were hoping to starve the shale revolution. At first, they seemed poised to succeed, like they had in the past. U.S. production fell from a peak of 9.6 million barrels a day to 8.5 million barrels a day. Bankruptcies riddled shale patches from Texas’ Permian Basin to the Bakken Formation in North Dakota, and tens of thousands of workers lost their jobs. Rather than declare defeat, shale companies dug in, slashing costs and borrowing like crazy to keep drilling. By late 2016 the Saudis blinked. They persuaded OPEC and the Russians to cut output. Slowly, steadily, West Texas Intermediate, the oil benchmark traded in New York, rose from $26 a barrel in February 2016 to where it lingers today. What didn’t kill shale drillers made them stronger. The survivors have transformed themselves into leaner, faster versions that can thrive even at lower oil prices. Shale isn’t any longer just about grit, sweat, and luck. Technology is key. Geologists use smartphones to direct drilling, and companies are putting in longer and longer wells. At current prices, drillers can walk and chew gum at the same time—lifting production and profits simultaneously. For OPEC, the emergent superpower presents an unprecedented challenge. If the cartel cuts production, shale drillers can respond by boosting output, stealing market share from OPEC nations and undermining their effort to manipulate prices. The only solution for OPEC is to prolong the limits, as it’s doing now, and hope for the best. If cooperation between OPEC and Russia breaks down, it’s not impossible that OPEC breaks down, too. If Shale 2.0 output keeps prices low, Russia would be a big loser. Moscow has used oil revenue to finance aggressive foreign intervention from Ukraine to Syria. The only solution is to continue cooperating with Saudi Arabia on keeping production low — not something the oligarchs relish. With shale surging, U.S. imports of Saudi oil plunged to a 30-year low last year. The turnabout makes China and Japan far more dependent than the U.S. on the Middle East. It’s now possible for the U.S. to argue that other countries should help shoulder the burden of policing the shipping lanes leading to Middle Eastern and North African oil exporters. Yet not all traffic lights are green for the U.S. It’s not immune from the ups and downs of the world market. When the price rises because of, say, political upheaval in the Middle East, it doesn’t matter where you are and how much you pump. The price rises in America, too. There’s another problem: Shale 2.0 could hurt refiners. Shale oil is too good. For years, refiners spent billions of dollars on special equipment to process the dense, high-sulphur, low-quality crudes coming from Mexico, Venezuela, Canada and Saudi Arabia. The quality of shale oil is so high that it yields little diesel, the fuel that powers manufacturing. Such limitations may be mere speed bumps. But U.S. dominance is far from a panacea. It won’t reverse climate change. It won’t lessen the political influence of fossil-fuel producers in Washington. Nor will it completely neutralize the political influence of erratic petrostates. With demand rising despite the emergence of renewables and the development of electric vehicles, shale may struggle to keep pace with global consumption. There’s a chance the world will witness that rarest of market loop-de-loops — high oil prices as well as rising U.S. production. Saudi Arabia and Russia could then remain formidable obstacles to U.S. energy independence. They would be crowing from the top of the hill even as they keep a wary eye on America’s shale drillers. These are troubles that would have been an embarrassment of riches for Americans who had to wait in line to fill up in the 1970s, when the U.S. determining its own energy future was just a dream. Any celebration over this accomplishment ignores the evidence that such dependence on fossil fuels is no independence at all. Somebody cut the cake – new documents reveal that American oil writ large was warned of global warming at its 100th birthday party. And so, at its hundredth birthday party, American oil was warned of its civilization-destroying potential. We in the petroleum industry are convinced that by the time a practical electric car can be mass-produced and marketed, it will not enjoy any meaningful advantage from an air pollution standpoint. Emissions from internal-combustion engines will have long since been controlled. Dunlop went on to describe progress in controlling carbon monoxide, nitrous oxide, and hydrocarbon emissions from automobiles. Absent from his list? The pollutant he had been warned of years before: carbon dioxide. Significant temperature changes are almost certain to occur by the year 2000, and these could bring about climatic changes. [...] there seems to be no doubt that the potential damage to our environment could be severe. [...] pollutants which we generally ignore because they have little local effect, CO2 and submicron particles, may be the cause of serious world-wide environmental changes. This early history illuminates the American petroleum industry’s long-running awareness of the planetary warming caused by its products. Teller’s warning, revealed in documentation I found while searching archives, is another brick in a growing wall of evidence. In the closing days of those optimistic 1950s, Robert Dunlop may have been one of the first oilmen to be warned of the tragedy now looming before us. By the time he departed this world in 1995, the American Petroleum Institute he once led was denying the climate science it had been informed of decades before, attacking the Intergovernmental Panel on Climate Change, and fighting climate policies wherever they arose. This is a history of choices made, paths not taken, and the fall from grace of one of the greatest enterprises – oil, the “prime mover” – ever to tread the earth. Whether it’s also a history of redemption, however partial, remains to be seen. American oil’s awareness of global warming – and its conspiracy of silence, deceit, and obstruction – goes further than any one company. It extends beyond (though includes) ExxonMobil. The industry is implicated to its core by the history of its largest representative, the American Petroleum Institute. It is now too late to stop a great deal of change to our planet’s climate and its global payload of disease, destruction, and death. But we can fight to halt climate change as quickly as possible, and we can uncover the history of how we got here. There are lessons to be learned, and there is justice to be served.